Day 1 of the AdVintage 2016 wine tour saw us in Kaštela, the administrative name for seven small towns east of Trogir and northwest of Split. This area has been growing grapes back to the Romans, Greeks and Illyrians ,with records of the first village vineyard from 852 AD (pre-dating the first Croatian Kingdom). However, it was the search for the origins of the Zinfandel/Primitivo grape that led to the discovery of 9 vines of Crljenak Kaštelanski (Tser-leeay-nak Kash-tel-anskee…the “red grape of Kaštela”) on the slopes of the Mali Kozjak mountain, which were shown to be the likely genetic source of “California’s Grape” (another Dalmatian grape “Tribidrag” also claims this). The story of this search can be seen on a (subtitled) YouTube Video (click link). 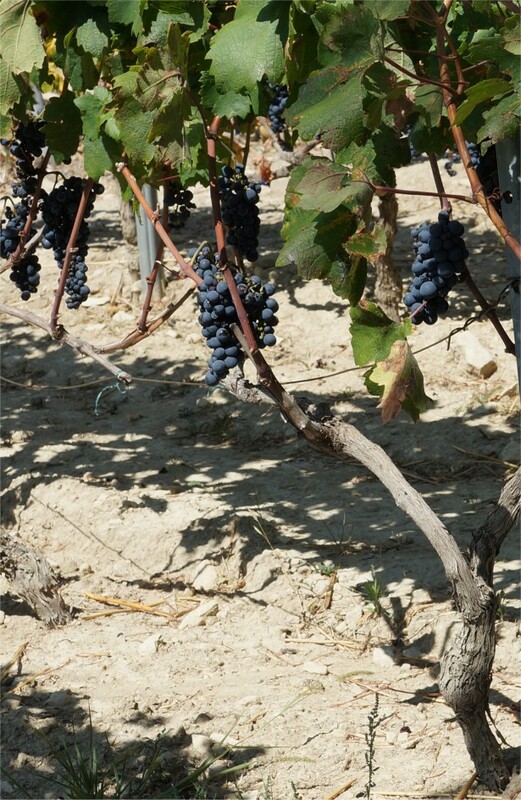 Cuttings of these vines were used to create nursing stock to replant the variety in the area, which was previously dominant to Plavac Mali (a genetic descendant of Crljenak and hardier to disease). Our first stop was to the Putalji Winery in Kaštel Sućurac, the “first” of the 7 Kaštelas (Forts), where owner and winemaker Anton Kovač welcomed us to his newly-built tasting veranda in the vineyards. 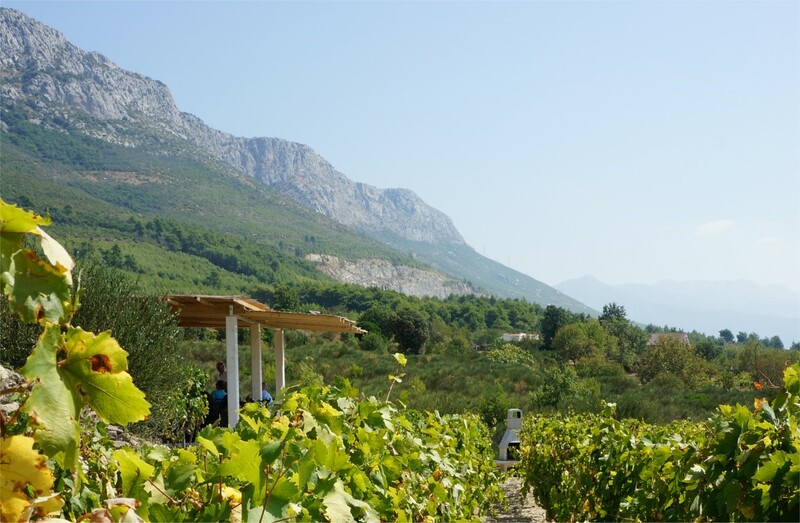 Anton’s family have been growing grapes in the area for over a millenium and were granted the land ownership around 500 years ago, seeing both the Venetian Republic and Austro-Hungarian Empire come and go (and almost seeing the Ottomans as well, as the ridge overlooking Split was as close as they got to this area of Dalmatian coastline). Anton replanted Plavac Mali and Crljenak vineyards in 2007/08 when he founded the new winery, and now makes 15-20,000 bottles of rosé and red each year. He has 6 vineyard plots 400m high, taking advantage of the slope’s southerly aspect and cooling wind from the Adriatic Sea below. 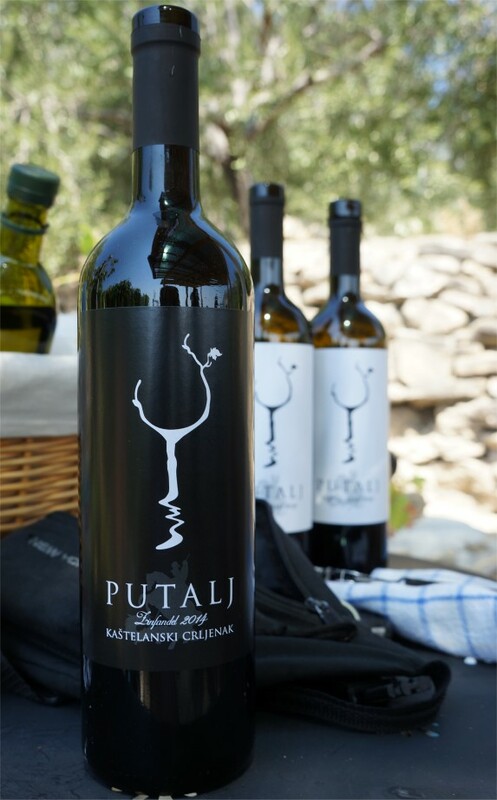 Anton named his wine “Putalj”, the name of small church on the slopes of mountain dedicated to St. George. He told us the label design has a triple meaning; the water source feeding the vine; a wine glass; and the profile of the hillside with the St. George Church (with a St. George slaying a dragon motif underneath). 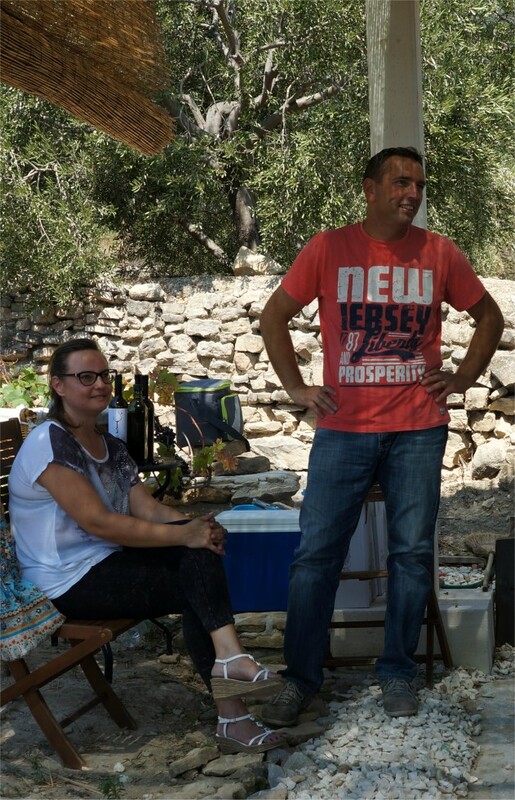 We were tasting the day before the harvest, and Anton and his wife Carmen also served us cheese and olive oil to help the wine go down. First was the 2015 Rosé, chilled and showing a light red-fruit nose with a touch of spice. On the palate it was fresh with strawberry fruit and a gentle texture, perfect as a patio drink. Then the 2 reds from the 2014 vintage, which Anton said was a tough year due to summer rain causing disease and reduced yield (but not quality). Both were aged in Slavonian oak. The 2014 Plavac Mali had a lightly smoky, spicy nose. It was medium bodied, slightly spicy on the palate (“nippy”) with dark fruit. This was a smoky, savoury wine with a bitter, dark edge, and ended up as our de-facto “house red” for several evenings (it never failed to please!). A good wine. Then the 2014 Zinfandel/Kaštelanski Crjlenak. Although 14.5% alcohol, it carried it very well, showing a spicy, dark nose with a bit of graphite and tar. It had an initially lean approach, good acidity, graphite again in the middle, and strong, ripe fruit (but not stewed) with a bitter undertone. This was an instant hit and was also tasted at the dinner table over the week – but more importantly 2 bottles were allocated for my return baggage! Anton and Carmen were kind hosts and the wine was a joy to drink (as it turned out this vied with the Grabovac tasting in Imotski as the best of the week). Our second visit of the day was to Vinarija Bedalov in Kaštel Kambelovac. This was for lunch at their waterside restaurant where Jakša Bedalov and his family served us local grilled vegetables, cheese and Croatian prosciutto (pršut). 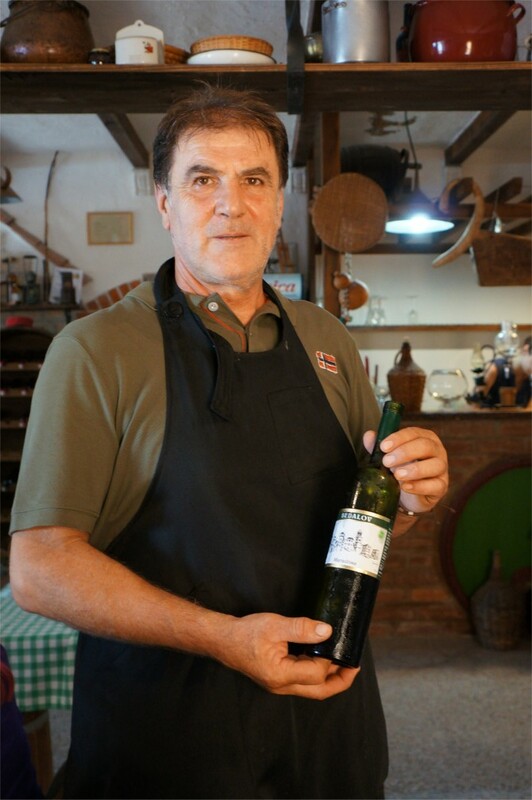 Jakša is something of a local wine legend; a 400 year-old plus family winemaking tradition; organically grown indigenous grapes; and all the vegetables on the menu are grown and cooked by him! He even was pouring the wines for us, starting with his 2015 Maraština white. 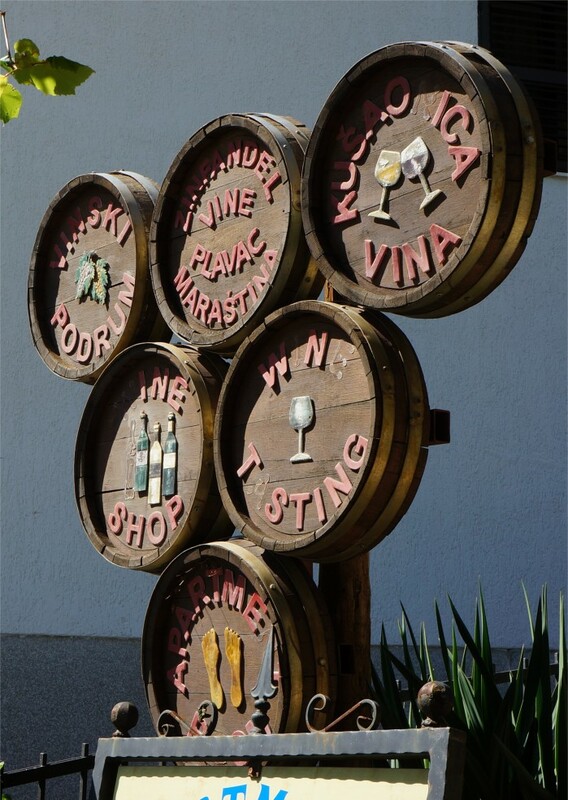 Maraština is closely related to the Italian variety Malvasia del Chianti and produces high acidity wines. The Bedalov had an “Italian” white nose; herbal, rich and creamy. 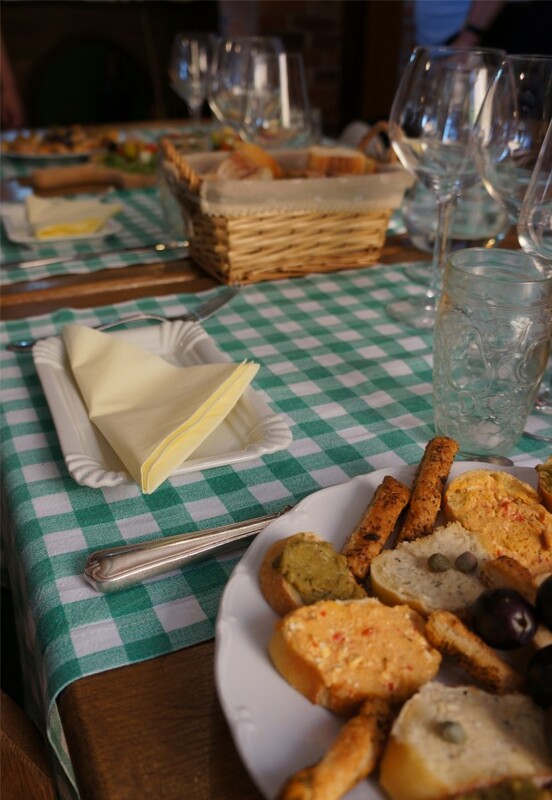 On the palate there was a refreshing minerality which went well with the pršut. Next was the 2015 Tribus Rosé, made from Plavac Mali, Crjlenak Kaštelanski and Dobričić. The latter grape is a parent of Plavac along with Crljenak, so this was a real family affair! It showed red berries and cream on the nose, a bit too acidic and the alcohol came through as overly warming, but was pleasant enough with the grilled vegetables. 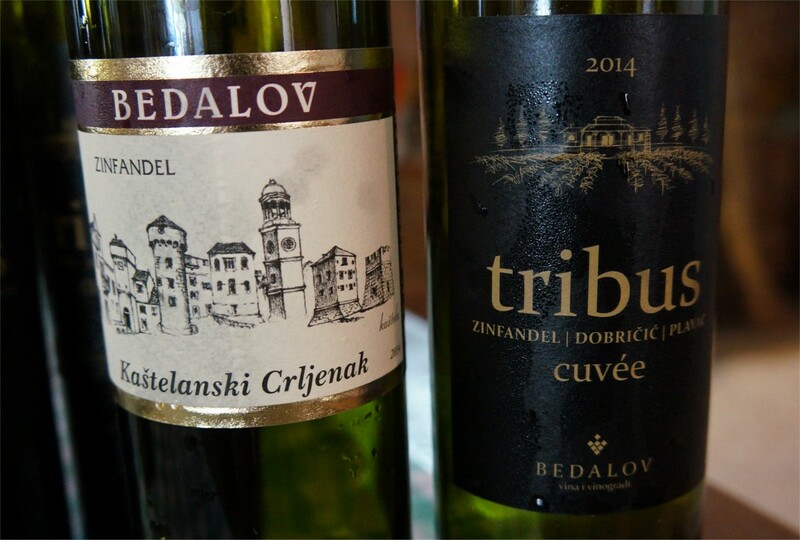 Then a pair of reds, with a Crljenak Kaštelanski followed by the Tribus Cuveé. The Crljenak had some volatility on the nose, a little bit Bretty, although structure and complexity were suggested. It was served (too) chilled and had a lean approach with spicy edges but with a tinny/metallic aspect down the middle. There didn’t seem to be enough fruit to carry it through, although it did improve in the glass as it warmed up (not sure if it may improve with a year or two bottle-age…or just being served warmer). The Tribus Cuveé – a blend of Plavac Mali, Dobričić and Crljenak – was more interesting but also served way too cold. It had a complex nose, balanced flavours with some Mocha (Cacao) and spice, medium body & texture and a dry finish. It would definitely improve with another year or so in bottle. 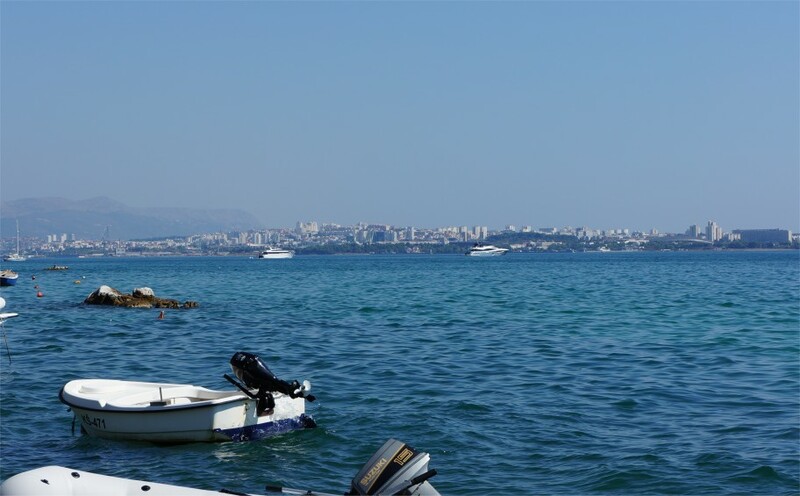 As we left to return to the hotel we had a great view out towards Split …. …. for our first day on holiday this was a superb introduction to Croatian wine and food, plus the glorious weather and Adriatic views we became used to.